- The durability to operate continuously for the entire day of museum operation. - High reliability to minimize maintenance. - High brightness and high definition to express the magnificent beauty of nature and water. - The Geometric Adjustment function to project undistorted images onto curved wall surfaces. - A high-precision Edge Blending function to achieve seamless projection from multiple projectors. Kurobe River holds a massive amount of water and is surrounded by precipitous mountains. It is well known that the large-scale electric power development in this secluded area was a major challenge for the Kansai Electric Power Company. 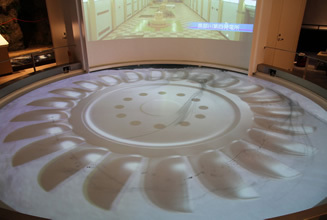 The Kurobe River Electric Memorial Museum, which displays this remarkable accomplishment and introduces the hydroelectric power activities of the Kansai Electric Power Company underwent renewal. 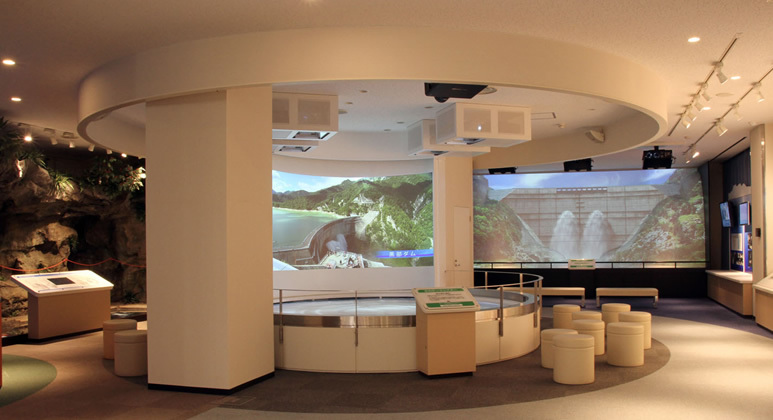 The dynamic images from the Panasonic projectors leave a lasting and breathtaking impression on visitors. The Kurobe Gorge was well known as a largely untrodden area. The full-fledged hydroelectric power development that began in 1924 has resulted in ten electric generation plants along the Kurobe River that flows through the Kurobe Gorge, making it one of Japan's major power-producing rivers. 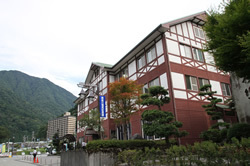 The Kurobe River Electric Memorial Museum was established by the Kansai Electric Power Company in April 1987. The natural beauty of the Kurobe Gorge and the human drama that accomplished the construction of the Kurobe Dam, which is said to be the "Project of the Century," are presented here. 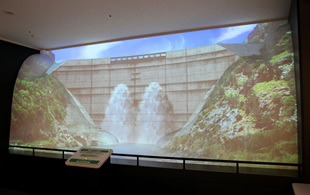 To cope with the aging of the museum's facilities and introduce the role and advantages of hydroelectric power generation, which is a form of renewable energy, to as many people as possible, the museum underwent a major renewal centering on a large-scale projection system. This museum operates for 10.5 hours a day, 7:30 AM to 6:00 PM, seven days a week, from April to November. 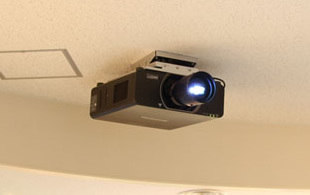 This requires projectors that can operate continuously for long periods of time, and that are highly durable against dust. so the amount of maintenance had to be minimized. water attained by the large-scale dam, it was necessary to provide more than simply flat-screen images. 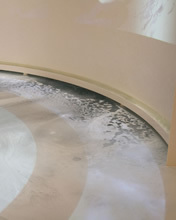 The first sight from the entrance is a Water Theme Theater with a white wall and round pool. 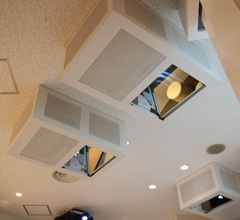 This theater was achieved by a projection system using advanced Panasonic projector technologies. 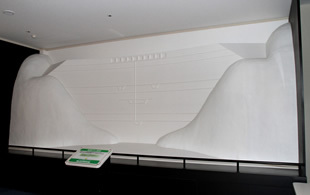 images onto this curved wall covered by flowing water, the Geometric Adjustment of the PT-DZ8700 was used. creating a theme that is called "Coexisting with Water." 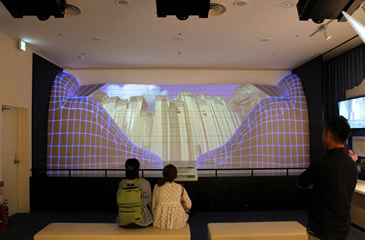 Sharp images are projected onto the curved wall. the water surface. This enabled the dramatic effect of projecting images onto the layer of bubbles. and ET-DLE080 short-throw zoom lenses make it possible to project a large, dynamic image even from a short distance. the plant appears from the bottom of the pool, leaving viewers with an impressive surprise. 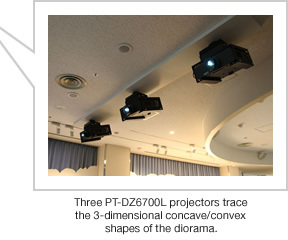 from the four PT-DZ6700L projectors. 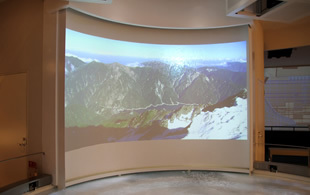 Three PT-DZ6700L projectors are used, and their Edge Blending function seamlessly projects images onto the diorama. with the extremely interesting effect of projection mapping. to dust, and their durability. maintenance cost of the projection system. Edge Blending function, and the selectable ET-DLE080 short-throw zoom lens was highly evaluated. the Kurobe Gorge, and the present status of hydroelectric development in a highly enjoyable manner. as possible learn about magnificence of hydroelectric power generation, with its ability to coexist with nature. This projection system reflects the desire of the Kansai Electric Power Company to convey this message. Murayama Inc., Kyoeisha Co., Ltd.
* The PT-DZ6700L is a lens-less model. The PT-DZ6700, a model with a lens, is also available.